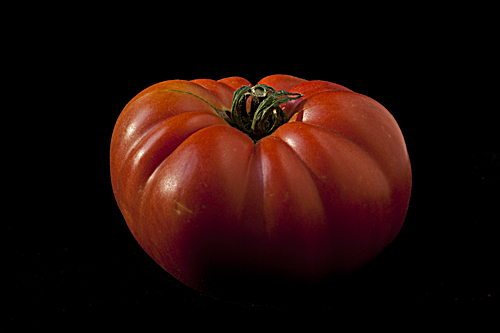 Costoluto Genovese – Tomato Town organically grows heirloom tomatoes in the greater Kansas City area as well as Johnson County, Leawood, Lenexa, Olathe, Shawnee, Merriam KS, Independence MO and Kansas City Missouri, KCMO. Varieties include: Cherokee Purple, Brandywine, Stupice, Carbon, Black Krim, Black Cherry, Yellow Pear, Absinthe and Aunt Ruby’s German Green. Wednesday morning, Farmer J found Farmer T in the midst of a victory dance. He had discovered a blushing Costoluto Genovese, a fluted Italian variety from Baker Creek. Of course, any tomato is reason to celebrate, but the first ripe fruit of the season is especially noteworthy. Tomato season has officially begun! This entry was posted on Friday, June 15th, 2012 at 5:47 pm. It is filed under Latest Posts, Spring Posts, Varieties. You can follow any responses to this entry through the RSS 2.0 feed.